Christians the world over are under pressure, facing difficulties and dangers of all kinds. Nehemiah was raised up to lead God's people at a critical moment, and the story of his practical realism and courageous faith is vital for Christians today. Providing an overview of the Nehemiah story, this book explains the critical importance of choosing God's priorities and truly hearing and responding to God's word. It tackles essential themes for Christian living, including how we can know God's protection under pressure, how we can build Christian community, and how we must live by God's standards. 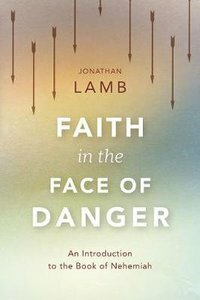 Faith in the Face of Danger is structured with sections and subsections that provide a clear set of preaching units that will serve preachers in building a sermon series but this is also an ideal book for individual or group use with questions, discussion points, ideas for action and further study suggestions. About "Faith in the Face of Danger: An Introduction to the Book of Nehemiah"
Jonathan Lamb is the Director of Langham Preaching, a programme which seeks to provide practical on-site support for a new generation of preachers and teachers, working with national leaders in organising training seminars, providing resources, and building a local movement committed to Bible exposition. He is the author of several books, including Tough Minds, Tender Hearts (InterVarsity); Crossway Bible Guide on 2 Corinthians; Making Progress in Church Life (Paternoster/Partnership) and Faith in the Face of Conflict. His most recent publications are Integrity: Leading with God Watching; From Why to Worship (InterVarsity), a study guide to the prophecy of Habakkuk and Godliness From Head To Toe a study guide to James. He lives with his wife, Margaret, and three daughters in Oxford, where they attend St. Andrew's Church.